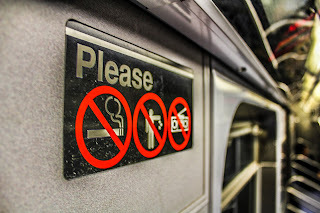 Tiny Home Big Life: 9 Tips to Quit Smoking. 9 Tips to Quit Smoking. 1. Find a reason. Your reason for quitting must be more important than your urge to light up. Think long and hard about what your reason is and keep it fresh in your mind. Is it the health of your family, your own health, the staining on your teeth and nails, the aversion your spouse or significant other has to the habit, to save money, etc? 3. Find other ways to relax and unwind. Since most people turn to cigarettes when they are stressed, it's very important to find some OTHER ways to unwind and de-stress. This may be music, massage, working out, reading, fishing, or other hobbies. 4. Determine your "triggers" and try to avoid or alter them. Do you typically smoke a cigarette after meals? Pop a piece of gum in your mouth instead. Does chatting with a specific person stress you out and make you feel the need to smoke? Avoid that person if at all possible. 5. Toss out ashtrays, lighters, and any left- over cigarettes themselves. You may consider washing anything in your home or vehicle that smells like cigarette smoke. 6. Avoid being around other smokers. If your coworkers all huddle together in the smoking section outside during lunch break, find a different non-smoking area to spend your lunch break at instead. 7. Think of a reward that you'd love to earn by quitting. It doesn't have to be something large and extravagant- a new shirt, book, or your favorite dinner will suffice. Have that reward to look forward to. 8. Whip up a batch of DIY "Quit Sticks" and chew on one of them when the urge hits. (In a small flat-bottomed jar- pour 2 tsp of coconut oil in, add 15 drops of cinnamon essential oil, add 15 drops of black pepper essential oil, arrange toothpicks standing up in the jar so all toothpicks are standing up in the oil mixture in the bottom of the jar, and allow to sit overnight. When a craving hits, grab a stick and chew on it. ) If you're interested in learning about my trusted brand of essential oils, you can find them HERE. 9. Use CBD oil to help kick the habit. It has been found to help smokers resist the urge to light-up. To check out my trusted brand of CBD oil, you can find it HERE.